Earlier this month, the Transport for the South East Transport Forum brought together a wide range of stakeholders from across the South East to help inform development of the region’s first transport strategy, which will be published for consultation in the autumn. These interactive sessions have given some hugely valuable insights into the transport requirements needed to support and drive the regional economy while maximising social and environmental benefits. They have also helped us stay on-track to deliver a strategy which is most appropriate for the South East and meets the needs of everyone who lives, works and spends time here. There’s clearly a huge amount of support for the work Transport for the South East is undertaking and a genuine commitment across the board to ensuring we – collectively – make the most of this opportunity. So, thank you once again for your time and input if you were able to attend. Already, some strong and consistent themes are emerging in terms of what our transport strategy should include and what it should seek to achieve. 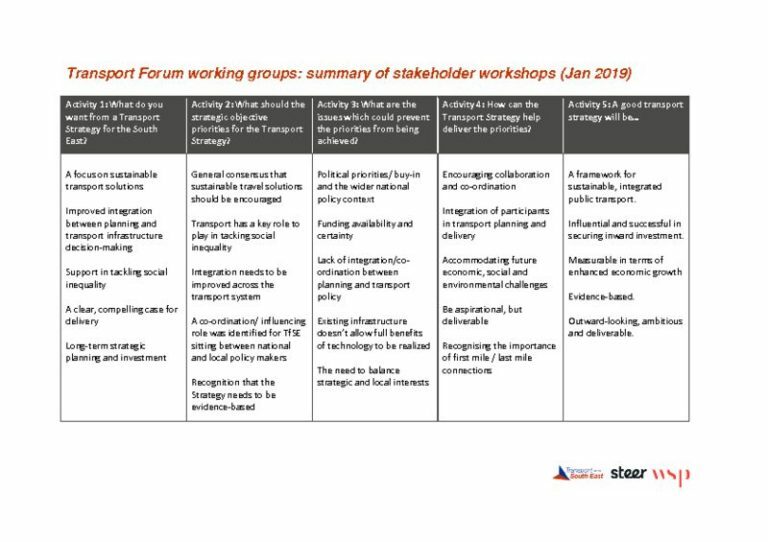 The attached summary brings together the key outputs from the first series of workshops and we will continue to provide similar feedback as the strategy is further refined throughout the year. We will be holding two further engagement rounds – in late March/early April and then in June – to provide additional opportunities to shape the transport strategy prior to public consultation.